2016, is about to end and like every year December brings with itself lots of energy to celebrate Christmas and the last day of the year. And celebration is not possible without decoration. 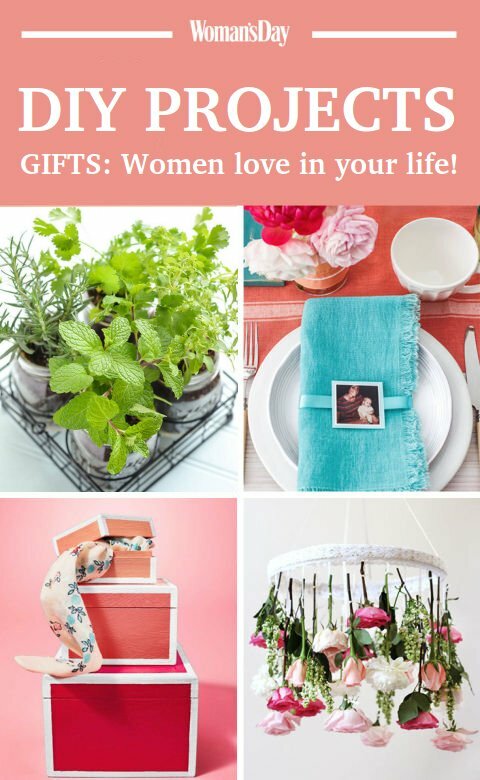 Here is DIY craft you can make wall hanging at home. It is really beautiful and cheap. 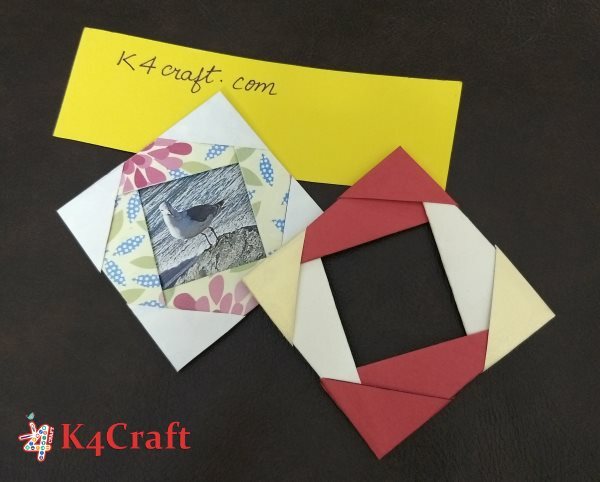 If you are a teacher you can try it out with your students, this way you will be able to make many wall hangings in one go. 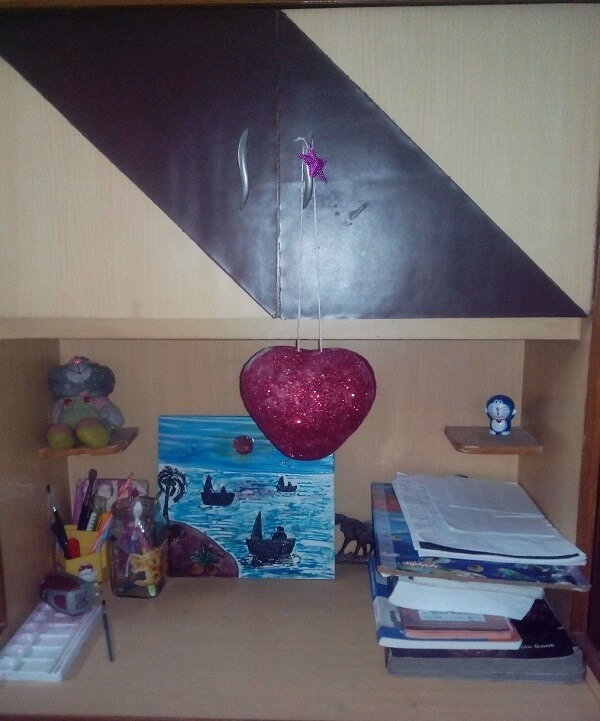 Before beginning cover your workstation with newspaper as this task is a little messy. Inflate the balloon and tie a tight knot. Tear newspaper into small pieces. Make sure the pieces are neither too small or big, square pieces of 1 inch are ideal for sticking. 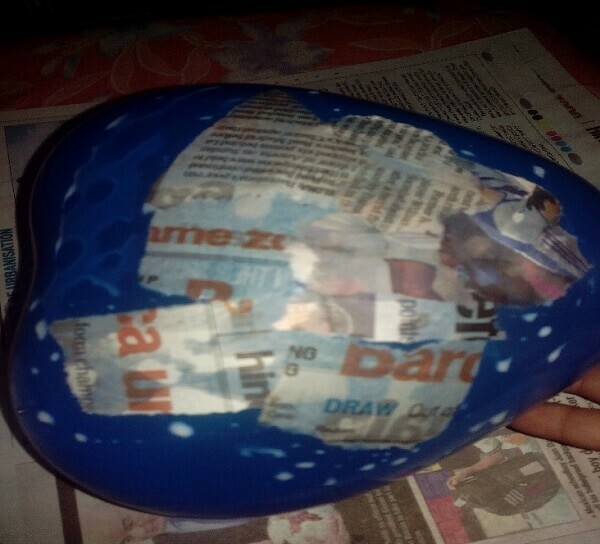 Apply the mixture of water and adhesive on the balloon and stick newspaper pieces on it. Stick the pieces with care, make sure the balloon does not bursts. Give another coating of the mixture on the newspaper layer. Let the balloon dry. It will dry in three to four hours. 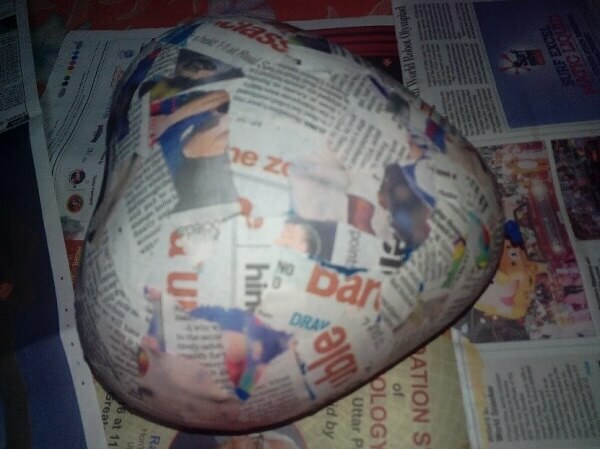 Add another layer of newspaper on the dried layer of newspaper. Repeat this step, six times more, so that you get a hard newspaper caste. The area around the knot of the balloon is soft, hence stick more paper near it. 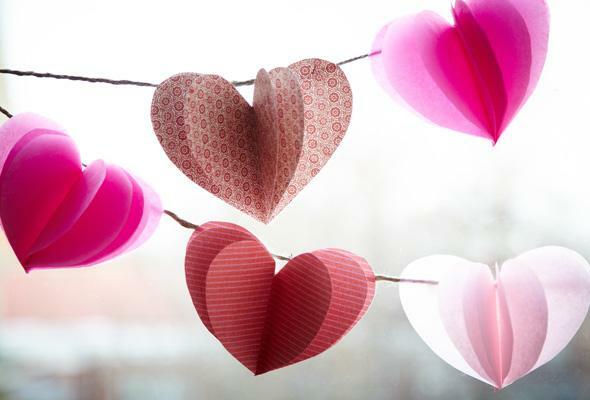 You can cut out small circles and paste it near the knot. 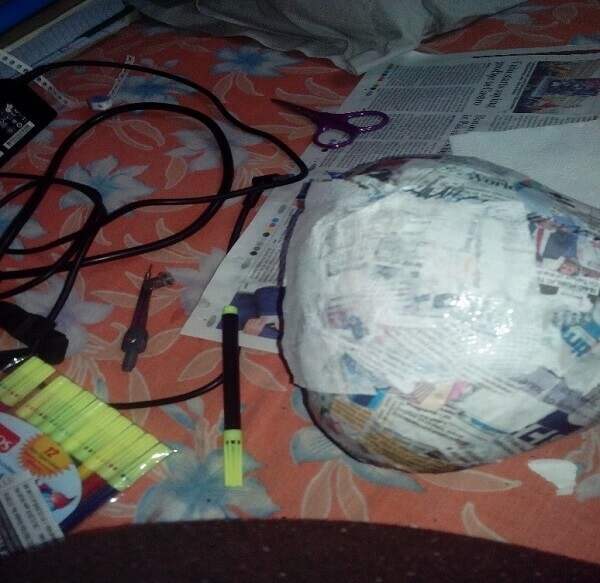 When the newspaper pieces on the balloon have dried stick a layer of tissue paper on it. 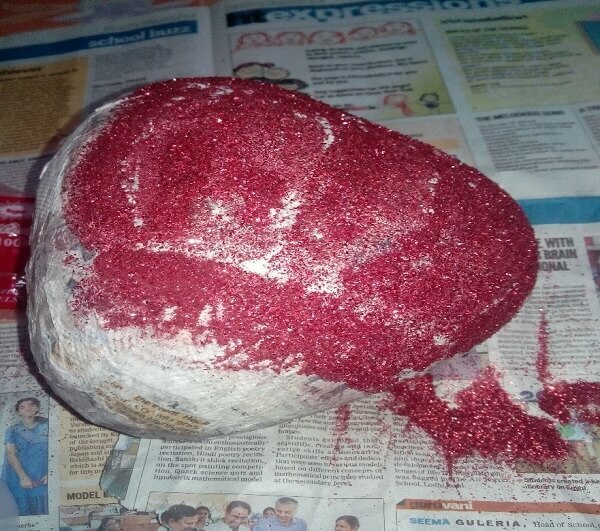 Now apply a layer of the mixture, and sprinkle glitter powder on the balloon. 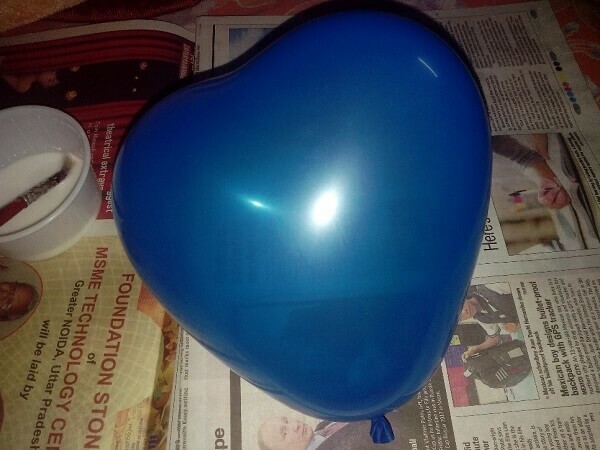 Make sure each and every part of the balloon is coated with it. You can add a thread so it can be hung. 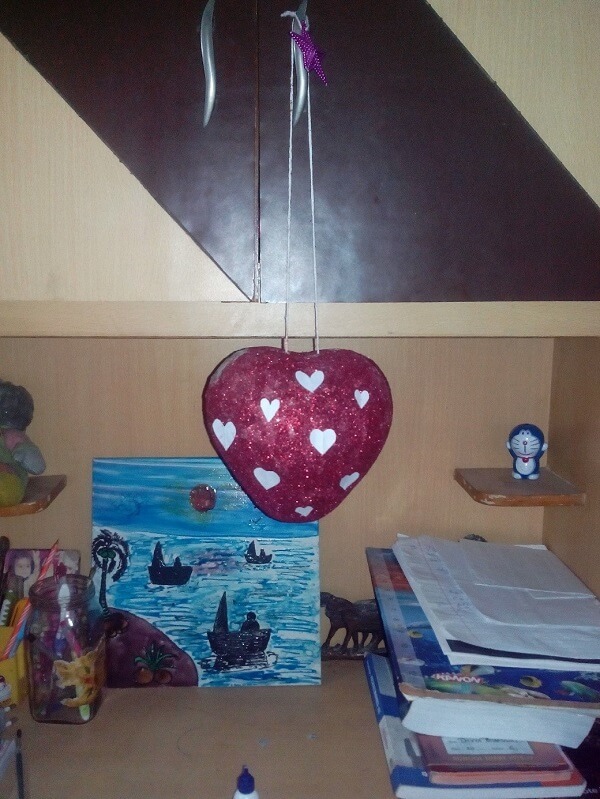 I added small hearts cut out from white paper so it doesn’t look plain. 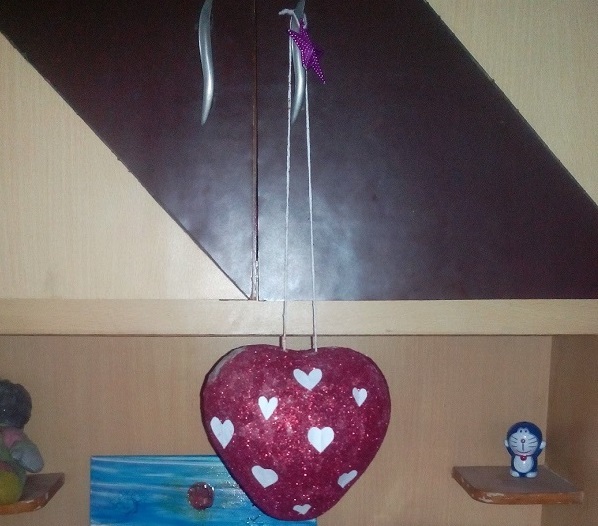 You can make any other pattern on the cast you have obtained, I used a heart shaped balloon you can take any other shape or size. The colour and pattern on the cast can be altered to make occasion specific wall hangings or show pieces. For instance you can use a round balloon with ethnic colours such as gold for Diwali, or a multi-coloured one for Holi. Hope, you like this tutorial. Thanks for visiting us. 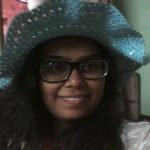 Insomniac, book lover and a manipulator with artistic bend of mind!